At a prominent meeting of African Union (AU) officials and higher education actors from across the continent, held at the Birchwood Hotel and OR Tambo Conference Centre in Johannesburg, South Africa, between 23-24 November, the Regional Universities Forum for Capacity Building in Agriculture (RUFORUM) announced a landmark operational move to Western Africa. 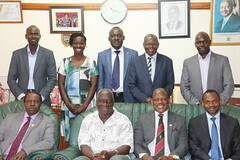 As part of a consultation exercise with Deans and Principals of African Schools and Faculties of Agriculture and related Sciences, the announcement heralded the development of the organisation’s new five-year strategic business plan for 2016-2020. The decision to expand its operational coverage from traditionally Eastern, Central and Southern Africa was reached following ground-breaking recommendations from RUFORUM’s biennial conference held in Maputo, Mozambique, in July this year and by the signing of a memorandum of understanding with the AU Commission. Having recently extended its research and training linkages to several countries in Western Africa, RUFORUM will now focus more closely on three anchor countries – Benin, Ghana and Nigeria – as part of a phased growth plan that has seen its higher education network increase from 10 universities in five African countries in 2004, to 46 universities in 22 nations, with the additionally announced admission of: University of Pretoria, South Africa; Nelson Mandela Institute of Science & Technology, Tanzania; University d’Abomey Calavi, Benin; University of Cape Coast, Ghana; and the University of Port Harcourt, Nigeria.